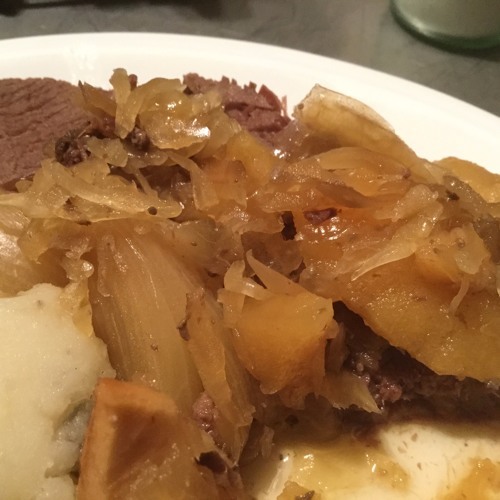 Crock Pot Deer (Venison) or Pork Roast with Sauerkraut, Apples, Onions and Brown Sugar. This is a hearty meal for these cold winter days. Easy to prepare and it cooks all day while you’re doing other more important things! Enjoy! Be sure to check us out online on Facebook and Instagram (@marymacbakehouse), Twitter (@marymacpodcast), and on our website! The domain is currently transferring over to our new hosting service, so we can be found temporarily at marymacpodcast.wordpress.com!